Can you feel it? The Force is here. As we published in our extensive SRAM Red AXS eTap coverage and early review, SRAM was transparent about a Force eTap AXS group coming in April when it unveiled the Red eTap AXS components in February. SRAM officially unveiled the Force eTap AXS components today. Cyclocross Magazine got an early look at the new products in March and brings you the details and differences compared to the SRAM Red eTap AXS components. SRAM unveils its new Force eTap AXS component group, in a dual chainring, 23-speed option. The group offers 33/46 and 35/48 chainrings but not the 37/50 option. Groups are 239-352g heavier. 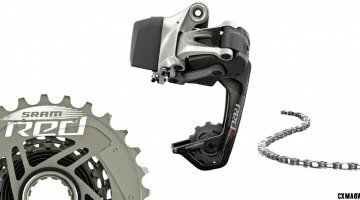 Of course, the Force group is more affordable and a bit heavier than its Red sibling, but SRAM maintains that a blindfolded rider won’t be able to tell the difference between the two groups in operation. Today, along with the announcement of the new components, bike companies are starting to unveil the first of 150 bike models that come equipped with SRAM Force eTap AXS. That’s three times the number of SRAM Red eTap AXS bikes. 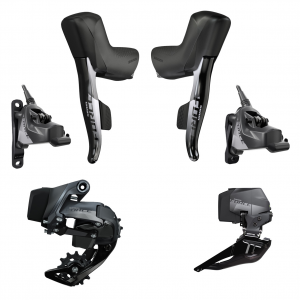 SRAM’s electronic family of components, called AXS (pronounced “access”), is more accessible to more cyclists with the introduction of the Force AXS eTap group. There are shared components, and shared technologies, but some differences in materials. SRAM maintains these differences are immaterial in function, but help keep costs down even if the grams bump up. To refresh your memory, SRAM’s AXS groupset brings wide-range gearing, chain management, 12-speed XD-R cassettes, mobile app configuration and Eagle AXS compatibility to road, cyclocross and gravel bikes in single and double chain ring configurations. The 23-speed, two chain ring setups in the Red group have 13-tooth jumps and are offered in a 46/33, 48/35 and 50/37t. Cassettes come in 10-33, 10-28 and 10-26t. SRAM unveils its new Force eTap AXS component group, with all the same 1x gearing options as SRAM Red eTap AXS. The 10-33 cassette offers similar range to an 11-36 but could allow for a smaller chainring up front. 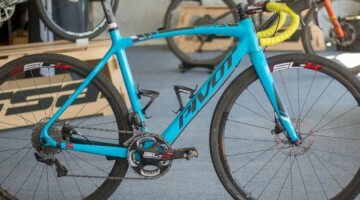 The 1x setup was cyclocross race proven by Jeremy Powers, and at the 2019 UCI Cyclocross World Championships in Bogense by Wout van Aert, Marianne Vos, Inge van der Heijden and Tom Pidcock. Most of those racers used the 10-33t cassette, which has similar range to a 11-36t cassette but doesn’t quite offer the wide range of a 10-42t or 11-42t many of us use for gravel. 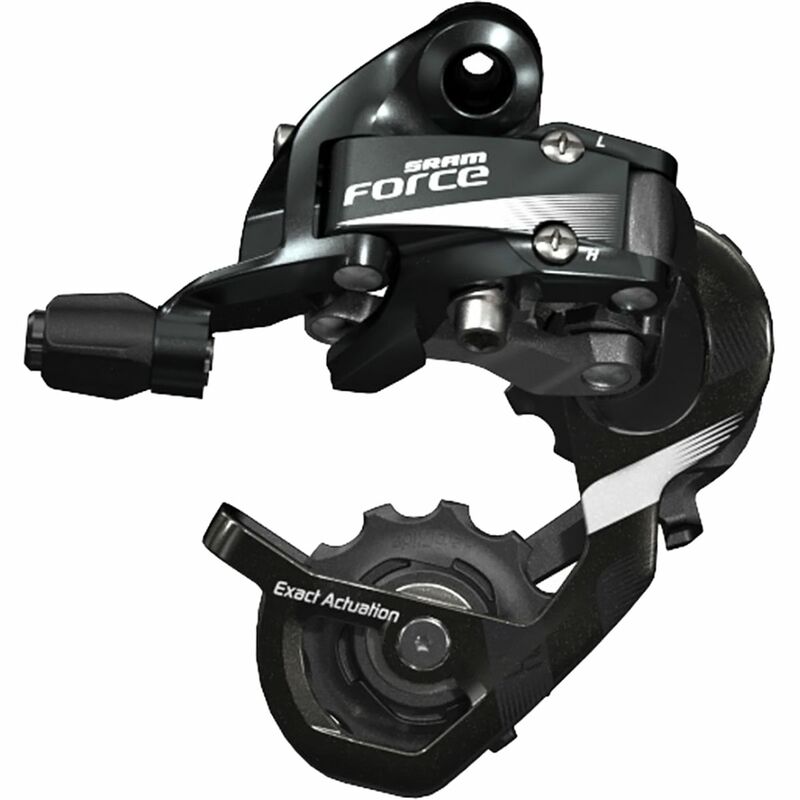 The Force AXS front derailleur uses a steel cage instead of a titanium/alloy version. The Force AXS rear derailleur pulleys spin on steel ball bearings, not ceramic, and skips the carbon cage of Red. 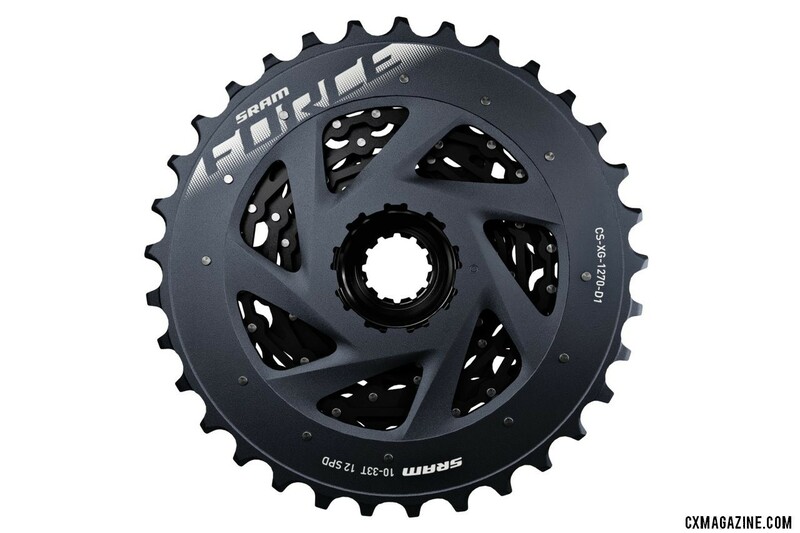 The Force AXS cassette eschews Red’s steel X-Dome construction for stamped and pinned cogs paired to a one-piece machined group of the four smallest cogs. The largest cog is still alloy. 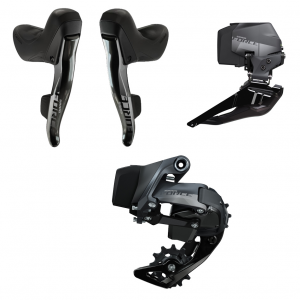 Force eTap AXS levers features a composite brake lever instead of a carbon fiber version. Each lever only accepts one Blip, not two as with Red. 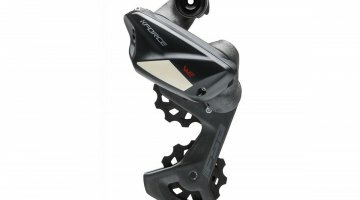 The Force eTap AXS hydraulic disc brake caliper is all new (the Red AXS eTap caliper is carried over from the previous Red eTap group). The caliper is manufactured using a two-piece construction, compared to the one-piece Red eTap AXS HRD caliper. The Force calipers only come in flat mount. The banjo of the Force disc brake calipers is now fixed, and angled for better brake hose routing to the frame or fork. The Red version exits the caliper parallel to the rotor, creating a small bend in hose routing as it heads back to the frame or fork. The Force eTap AXS crankset does not have a machined one-piece two-ring configuration. Rings are available individually but are still designed to be used in 13t jumps (a 33/48 pairing is possible but with poor shifting). The 33/46 and 35/48 are available, but the 37/50 chainring combination is a Red-only item. 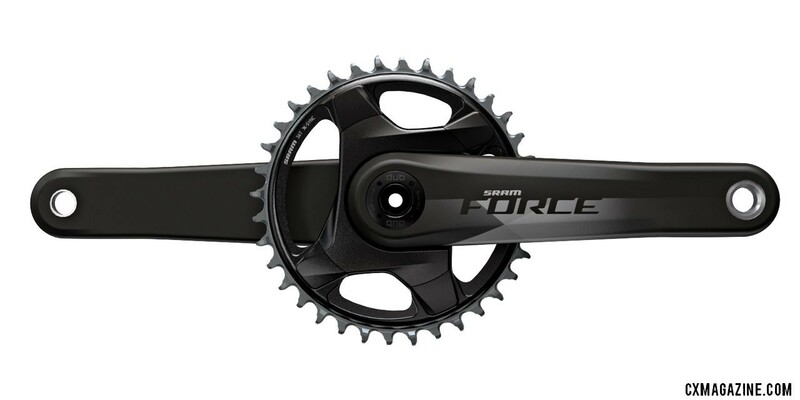 The optional $599 power meter for the SRAM Force eTAP AXS crankset is a spider upgrade, not built into the chainrings as with Red. The biggest upside is that if you need to replace your dual chain rings on your power meter crank, it won’t cost you $800 as it does with Red. The Force eTap AXS FlatTop chain does not have hollow pins. What’s the same? The Red and Force groups share the exact same two-piece rounded-edge Centerline rotors, the same shift paddle, rubber hood, X-Sync 2 1x chainrings and DUB bottom bracket options. SRAM unveils its new Force eTap AXS component group. 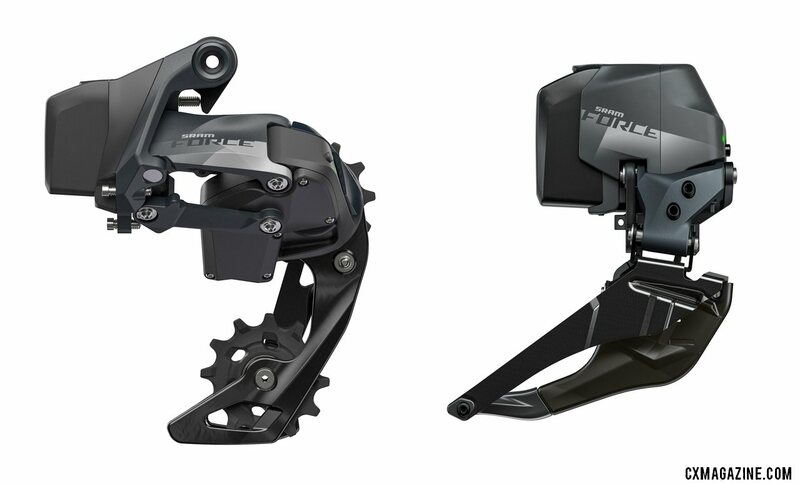 The Force derailleurs use heavier, more affordable cage materials. The SRAM Force eTap AXS groupset is significantly lighter on the wallet even if it’s heavier on the scale. 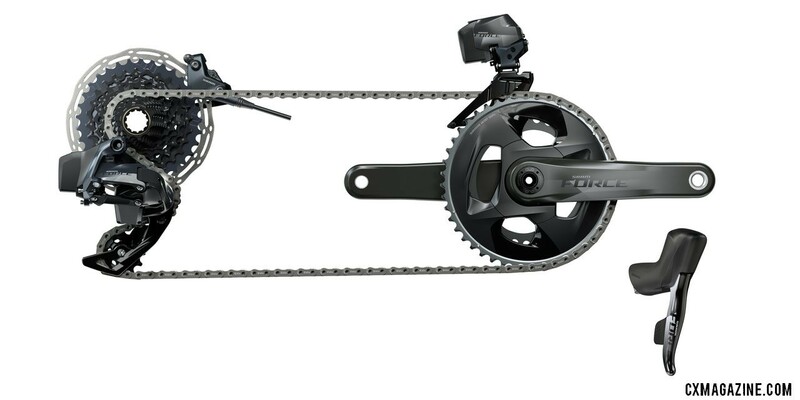 The two chain ring hydraulic disc option at $2,678 retails for $970 less than the equivalent Red group, while the one chain ring configuration is $870 less than Red. Of course, the Force group is heavier, but the savings is far above the $1/gram threshold many weight weenies hold dear. The 2x Force group weighs 294g more than Red, while the 1x setup is 239g more. That’s a whopping $3.65 per gram of savings if you’re trying to justify the jump to a Red group. Most of the weight penalty comes from the crankset. 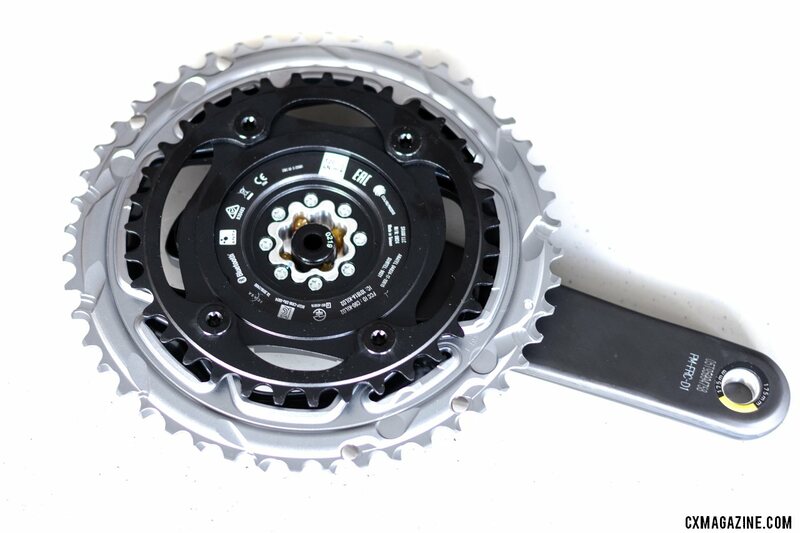 A 2x (48/35t) crankset is 183g heavier than the Red equivalent. The SRAM Force eTap AXS crankset comes in 2x, 1x, and spider-based power meter options. Dual rings are separate rings, unlike Red’s one-piece unit. SRAM unveils its new Force eTap AXS component group. This weight comes from moving away from the one-piece dual-ring setup, and also from a crankset axle that isn’t as heavily machined as its Red sibling. The next biggest contributor to the weight gain is from the cassette. The 10-33t Force cassette is 57g heavier than the Red version. The Force eTAP AXS cassette saves dollars at the expense of grams with seven stamped and pinned cogs instead of X-Dome construction as seen with Red. SRAM unveils its new Force eTap AXS component group. 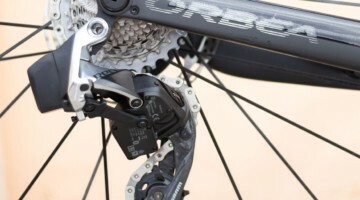 Although SRAM didn’t unveil the wider-range cassettes or a WiFli derailleur option that made our wish list after testing the group, Force eTap AXS does have a few changes that might please cyclocross and gravel cyclists. While minor and mostly aesthetic, the disc brake calipers have cleaner hose routing. The banjo is angled towards the frame, as opposed to the Red caliper’s hose which is parallel to the rotor. SRAM unveils its new Force eTap AXS component group. 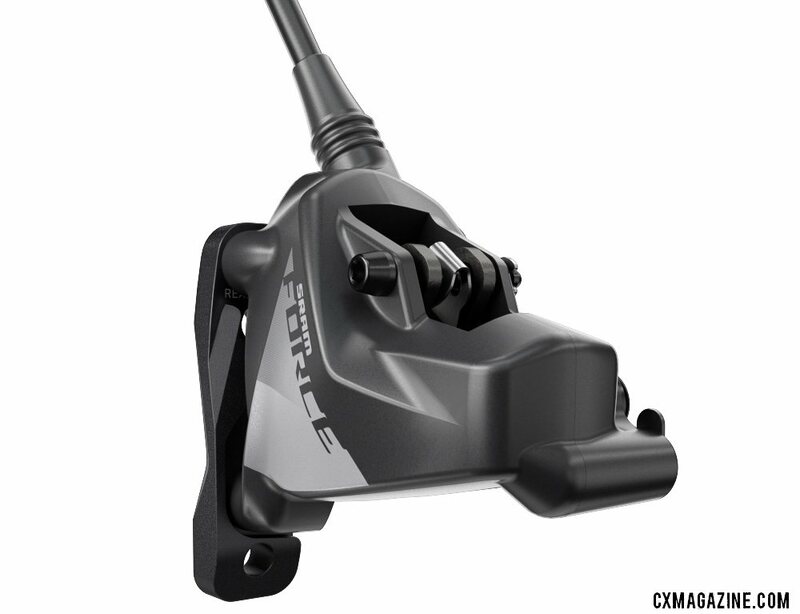 The disc brakes only come in flat mount but unlike the Red unit, the Force caliper is brand new for AXS, features two-piece construction and cleaner hose routing. SRAM’s Daniel Slusser reports that this avoids a small hose bend that was common with Red. 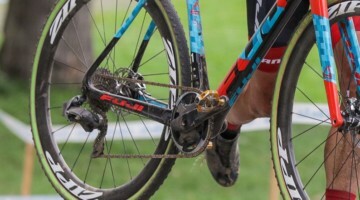 The bigger enhancment, at least for cyclocross racers on 2x drivetrains, is with the Force chain rings. After our initial SRAM Red eTap AXS report, Mother Nature blessed our testing grounds and cyclocross courses with plenty of mud. We found that while the Red eTap AXS one-piece chainring design is handsome and light, it offers many areas for mud to collect and little room for it to escape. While most cyclocross racers will gravitate to the 1x configuration, cyclists looking for a year ’round cyclocross and gravel setup and wider gear range than the 1x (non-Eagle) options offer may prefer the heavier but more traditional chainrings of the non-power Force crankset over the Red option. They might clear mud and organic material better than the Red version. 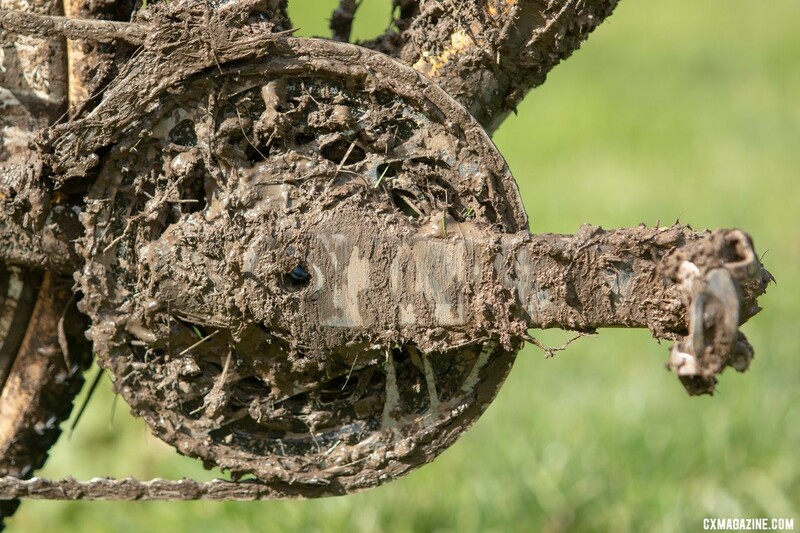 Sure, the Force 2x crankset is 183g heavier, but that beats running to the finish on a muddy day. The other option is to invest in the X-Sync ring for the really sloppy days. 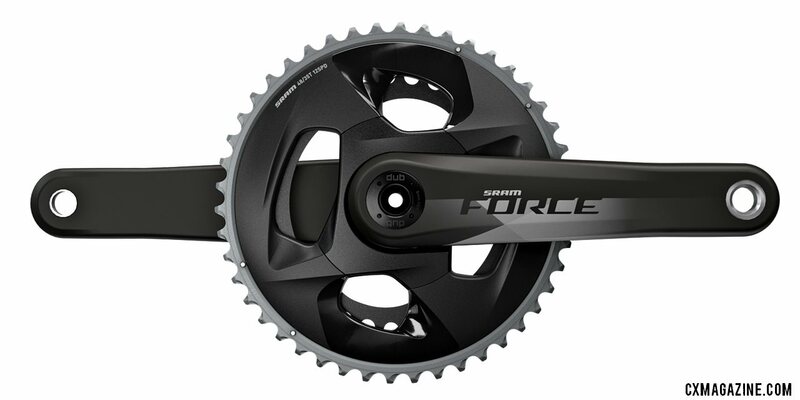 The SRAM Force eTap AXS crankset comes in 2x, 1x, and spider-based power meter options. The X-Sync2 rings are the exact same rings as used by the Red eTap AXS crank. SRAM unveils its new Force eTap AXS component group. Stay tuned for a full test and comparison. Official SRAM announcement below the photo gallery. You asked. We listened. eTap® is now available for Force. SRAM Force eTap AXS™ offers the key features of RED eTap AXS™—modern gearing, advanced chain management, and easy personalization—in a more affordable package. Exploring new limits has never been easier. SRAM Force eTap AXS™ is now available on a wide variety of bikes and for purchase at a bike shop near you today. The SRAM Force eTap AXS™ front derailleur is AXS™ enabled for easy personalization. The redesigned derailleur offers better rear-tire clearance—for those that explore all roads—and works perfectly with all chainring combinations. No compromises; never miss a shift. One rear derailleur to rule them all. 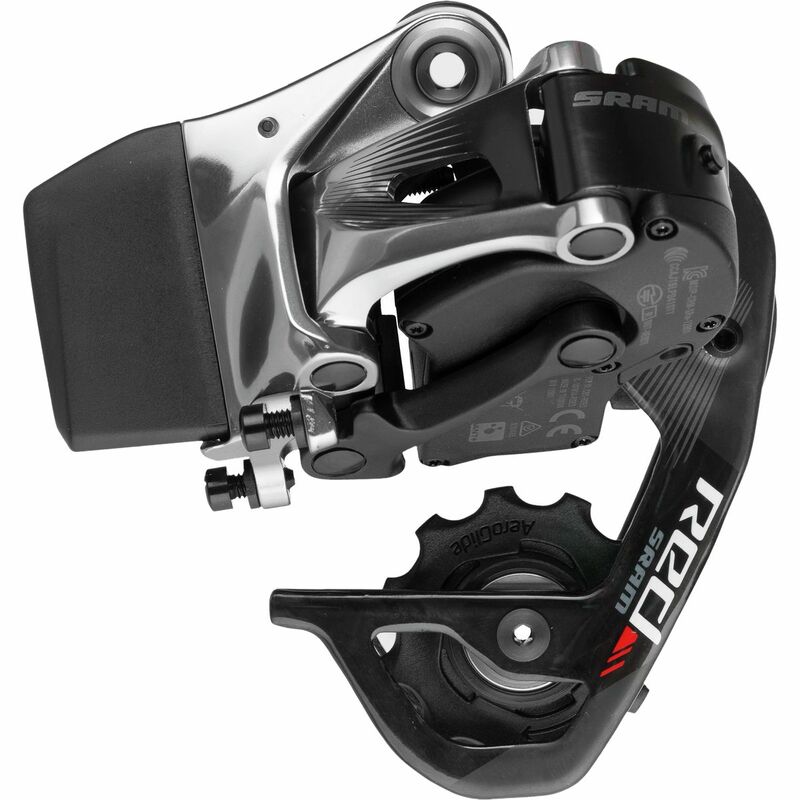 The SRAM Force eTap AXS™ rear derailleur is designed for both 1x and 2x systems. It capitalizes on X-Range™ gearing technology for enhanced range and chain management and features larger pulleys for improved durability and efficiency. Strong, smooth, quiet and AXS™ enabled. Beyond an incremental improvement. 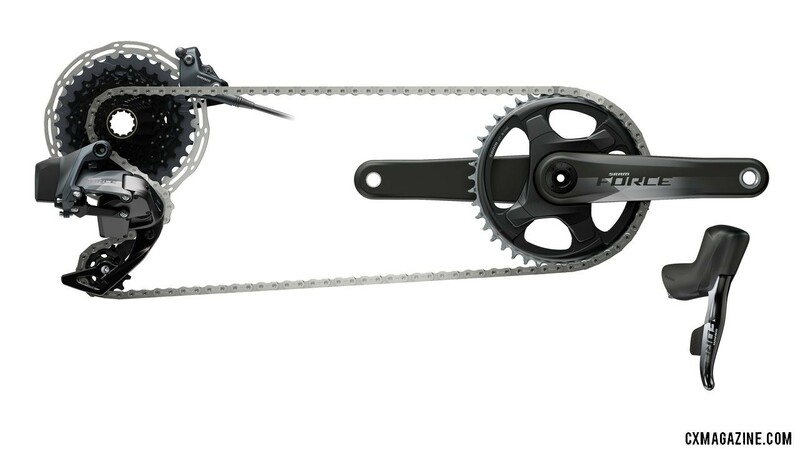 The Flattop™ technology of the SRAM Force® chain creates a lighter, quieter, stronger chain. Ride far, long and fast—this chain can go the distance. Wireless electronic shifting and hydraulic disc braking: the best of both worlds. 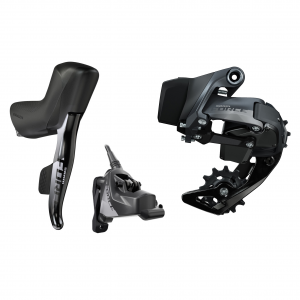 The SRAM Force eTap AXS™ HRD shift-brake system integrates top technology into an efficient package and offers AXS™ for easy personalization. 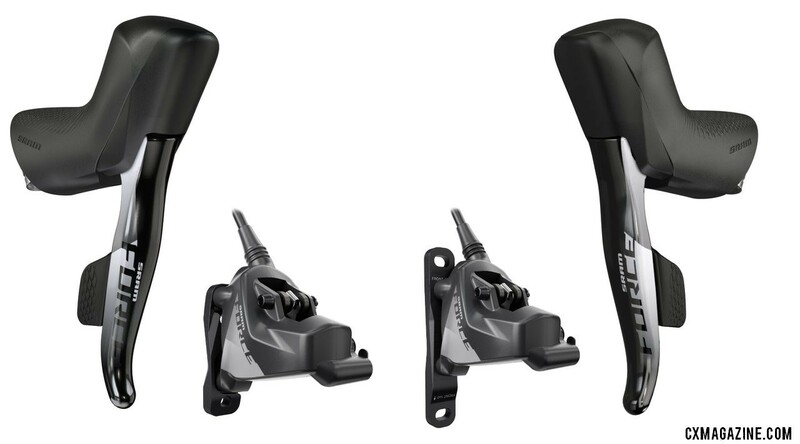 Combining the tradition of mechanical rim brakes and the precision and efficiency of modern electronic shifting, SRAM Force eTap AXS™ shift-brake levers are fully wireless and fully personalizable. Classic is now new. Riders want more range and closer steps between gears—and that’s the driving design principle of the SRAM Force® crankset. It offers smaller chainrings with a consistent 13-tooth gap between size variants, delivering smooth, accurate and dependable shifting for the modern rider. Always find the sweet spot. We pioneered the 1x drivetrain, and the SRAM Force® 1 crankset evolves the innovation. It’s lighter, stronger and simpler—non-aero chainrings can now be installed with a single tool. For cross, TT, tri and crits, this is the king of 1x. Power up. 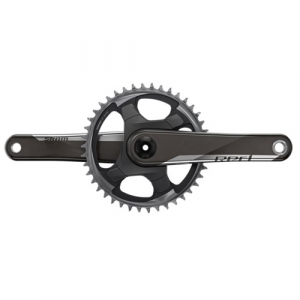 Upgrade your existing SRAM eTap AXS™ crankset to a power meter with this spider, featuring Quarq DZero technology. Designed specifically for road riding, the SRAM CenterLine XR (CLX-R) rotor is the perfect complement to a new SRAM eTap AXS™ drivetrain.